Wattles Mansion Showcase House @ Wattles Mansion, Hollywood. 2:00 pm- 7:00 pm. REITZHAUS teams w/ acclaimed interior designers for this first of its kind event. 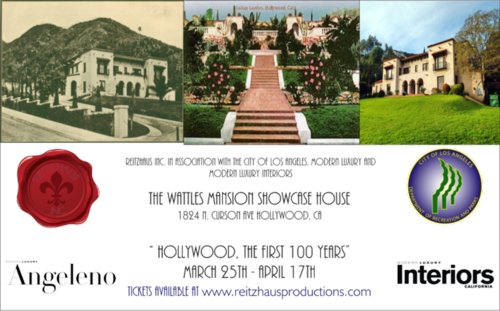 The theme for the showcase is ‘Hollywood, The First 100 Years’. Designers will use past movies or Hollywood stars as an inspiration for the rooms they will design. Interior designers influence style and the Hollywood years have done the same. This creative process will be a unique endeavor. Event benefits the City of Los Angeles Department of Recreation and Parks, Homes for Heroes, and The American Society of Interior Designers Foundation. This is a historical landmark. Persons with disabilities are welcome to attend. Reasonable access to the patio and main level of the house are available. Visit www.wattlesshowcase.com for more information. This tour will be open rain or shine. Parking lot on Sierra Bonita, as well as, street parking. No Large Purses or Backpacks. No Children under 11 years old will be allowed on the house tours. This Historic home is not ADA Accessable. For further informations & questions, please contact Reitzhaus @ 818-508-5200.